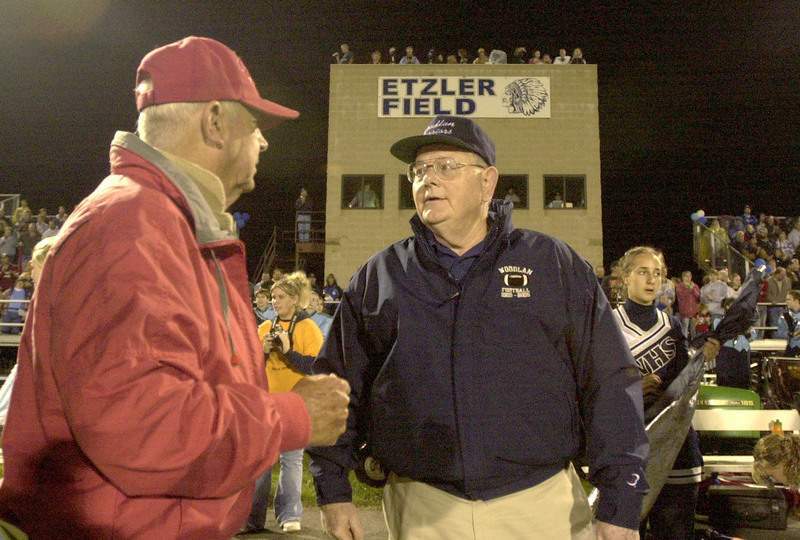 File Photo | Former Woodlan football coach Leland Etzler, right, talks with former school athletic director Ray Gilbert in 2005 after the school's field is named after Etzler. At 78, Etzler died Sunday. Leland Etzler, a legendary football coach at Woodlan for decades, died Sunday at 78, his family confirmed. Funeral arrangements haven't yet been determined for Etzler, who coached the Warriors for 40 years and won 11 ACAC championships. His career record was 287-117-2 – he is tied for 13th in state history in victories. He coached undefeated teams in 1965, 1968 and 1970. Woodlan reached the Class A state-championship game in 1981, losing 7-6 to Hamilton Southeastern. Among those who played for Etzler was Terry Hoeppner, the late Indiana University and Miami (Ohio) coach. Etzler, who retired in 2005, had 45 former players go on to play in the college ranks, 52 go on to coach, 38 academic all-state selections and 82 father-son combinations.